In the film that catapulted Sigourney Weaver into stardom as one of Sci Fi’s most badass female icons, Weaver stars as Ellen Ripley, part of a seven man crew of the commercial towing ship Nostromo, which, after intercepting a weird transmission from a planetoid, is roped into a detour to investigate its source. However, the crew get more than what they signed up for after discovering that the transmission was actually sent out as a warning by an alien whose ship they find stranded in the planet. As the predator responsible for alien’s death finds the way to join the crew on board the Nostromo, the ship becomes a death trap and what remains of the group must find a way to escape alive. ICONIC ALIEN. 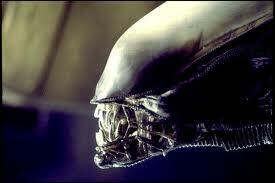 Throughout the franchise, this alien model has mostly retained its original look, only undergoing slight modifications. In fact, the design for the original Alien was so good that even now, over 30 years after it was originally shown in theaters, it is still one of most recognizable characters in the Sci Fi genre. Its design was actually so advanced, sleek and innovative that throughout the Alien franchise, the design mainly stayed the same as its effectiveness and brand value is enough to sell the movies, even the clunkier chapters of the series. 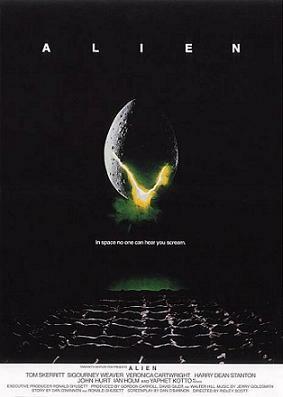 The first movie in the franchise was originally released in 1979, before I was born and I only got the opportunity to see the full movie recently on cable. Directed by Ridley Scott (Gladiator, Black Hawk Down), the film truly set the bar for future films of the same genre in terms of set, effects and costumes. What I liked about Alien was the intelligent use of suspense in outer space as well as the strong characterization among members of the Nostromo crew. 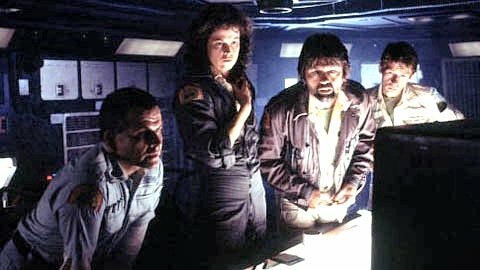 Tom Skerrit as Captain Dallas had a really strong chemistry with Weaver’s Ellen Ripley and all Skeritt really had to do was be in the room to exude an air of leadership (a trait that has only grown more pronounced as he grew older in the acting business). Weaver, on the other hand, truly stepped up as the film’s heroine, using her wits and resourcefully warding off aliens that have the bad habit of alien eggs in their host’s bodies and reproducing in the grossest way. The progression of her character in the first Alien until the fourth movie of the franchise she reprised her role was part of the reason why geeks of all ages see her as a goddess. In this installment, she used her smarts against the aliens but in succeeding chapters when she knew more about the enemy, she was bolder and more sure of her actions — killing scores of aliens in the process. Also a credit to this movie is the great thought and detail that went into the set. I bet that it can still hold its own against any set produced today by any Hollywood studio. While the technology has changed a bit from then and now — there were a lot of switches used for take off instead of buttons and touch screen and voice command monitors that is the trend these days but in terms of suspense, the switches worked because it took more time which contributed to the air of danger. Prometheus was recently released as a prequel to the 1979 movie and generally, it was pretty consistent with the elements, except for the technology and the scaling of the original Alien movie and its prequel but the fact that most of the same elements remained uniform in both movies is s testament to the strength of Alien’s sustainability in the industry and its ability to be a trendsetter even as far back as three decades ago. PLAGUED BY AN ALIEN. Ash (Ian Hom), Ripley (Weaver), Dallas (Skerritt), and Kane (John Hurt) confer about the transmission. All in all, I thought that Alien was one of the best Sci Fi flicks that I have seen to date. It truly deserved the cult following that it developed for the franchise because it pushed the boundaries of the genre and gave even non Sci Fi fans something to sink their teeth into. It is, I dare say even better than some of its sequels despite the more advanced special effects. Alien was awesome. ‘Nuff said.